North introduces the Chemical Resistance Guide to provide general advice for choosing North's chemical handling gloves. This color-coded chart recommends gloves for everything from Acetaldehyde to Xylene, 138 hazardous chemicals in all; plus information on the glove's physical performance. Hang it on your wall like a calendar or carry it in your safety resource binder. North Safety Products' easy to understand Chemical Resistance Guide provides you with glove recommendations for North's chemical resistant gloves. Chemical resistant glove materials react differently to each chemical exposure: the Chemical Resistance Guide keeps you informed on everything from Acetaldehyde to Xylene, 138 hazardous chemicals in all. The Chemical Resistance Guide is a chart that you can hang on your wall and read like a calendar, plus it's also three-hole punched to easily fit in your safety resource binder – just grab and go! North Safety Products also offers the ezGuide™ product selection program for North's hand protection and respiratory protection products; the ezGuide is easily available on the North website at www.NorthSafety.com. 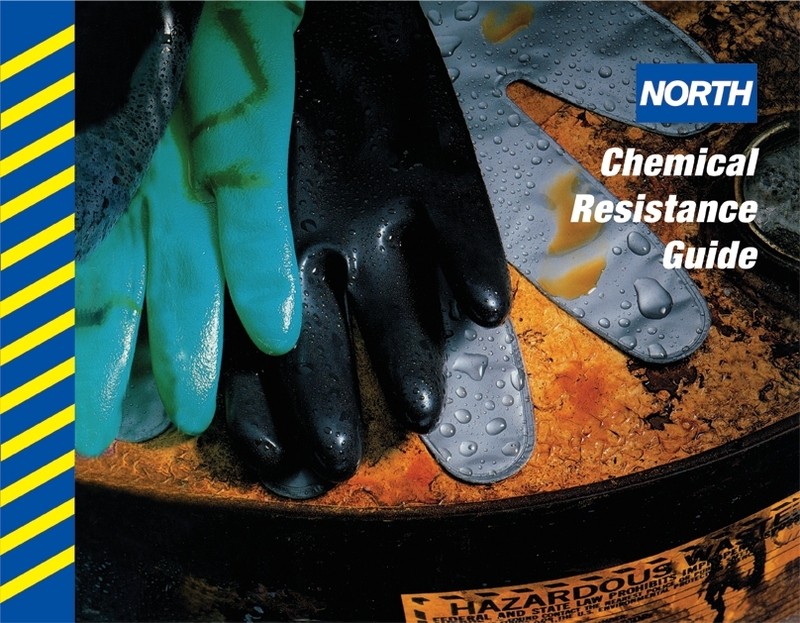 Contact North today to learn more about our full line of hand protection and about how you can obtain your own copy of the Chemical Resistance Guide by North Safety Products. North manufactures many products to protect you from chemical hazards - ask us how we can help you. Call us toll free at 888-422-3798, or email us at marketing@northsafety.com. Viton® is a registered trademark of the DuPont company.